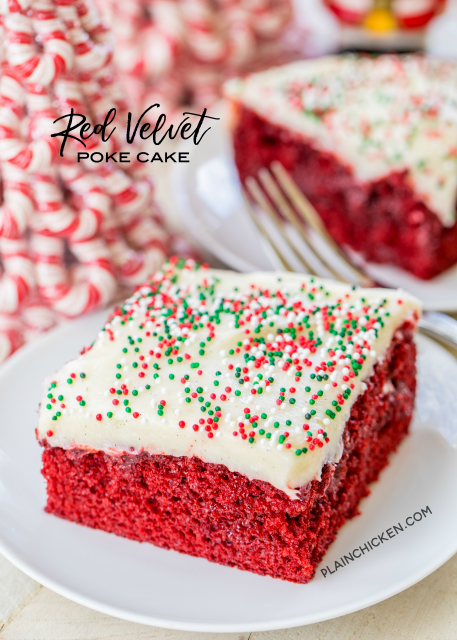 Red Velvet Poke Cake - red velvet cake soaked in sweetened condensed milk and chocolate and topped with a quick homemade cream cheese frosting. SO good! Great for potlucks and the holidays. 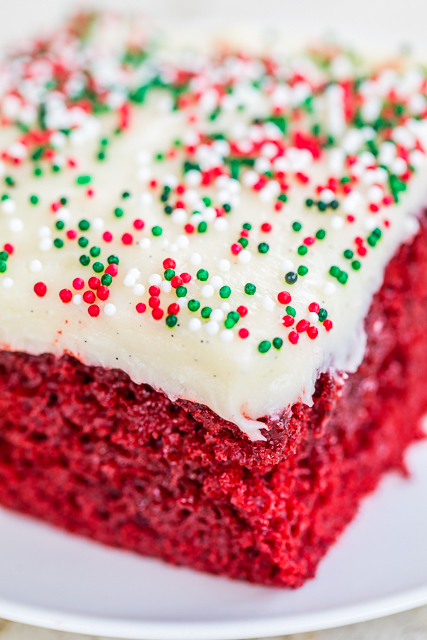 I think Red Velvet Cake is a requirement for the holiday season. 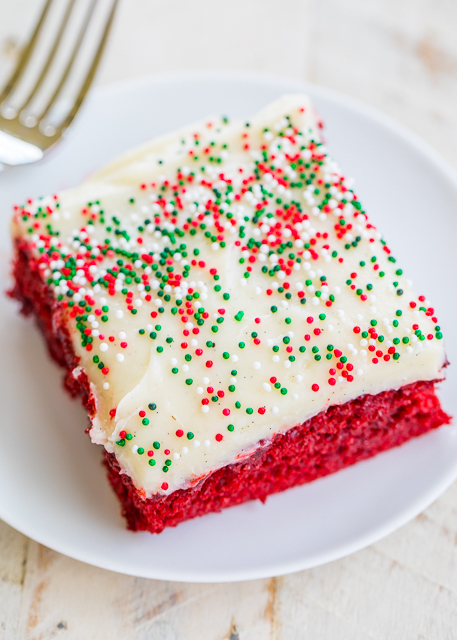 This Red Velvet Poke Cake is definitely required for any holiday celebration this season! OMG! This cake is out of this world delicious! Poke Cakes are one of my favorite desserts because I can make them a few days ahead of time and they get better the longer they sit in the fridge. Letting it sit in the fridge overnight gives the cake time to soak up all that yummy chocolate and sweetened condensed milk. It is hard to wait overnight to eat the cake, but it really is better if you can muster up the will power to wait. 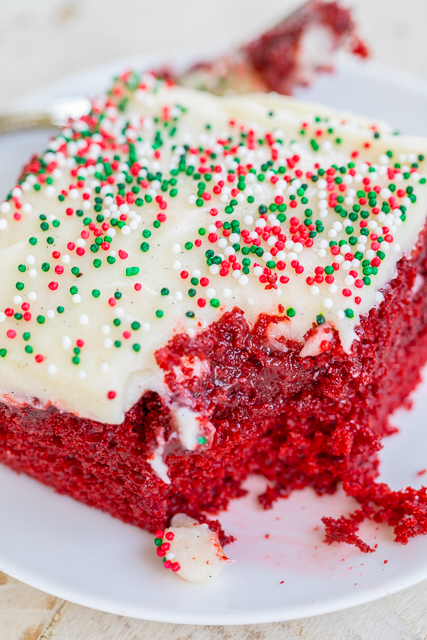 The star of this recipe might be the quick homemade Cream Cheese Frosting! OMG! It really puts this poke cake over the top!! 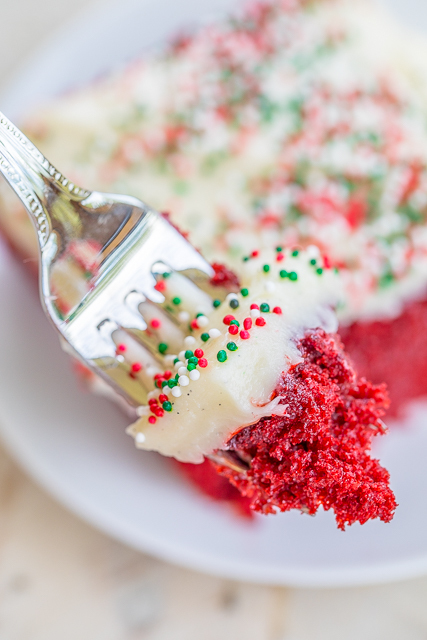 This Red Velvet Poke Cake is going to be a staple at all of our holiday parties. It is great for potlucks or even a homemade gift. Bake the cake in a foil pan and pop a bow on top. While cake is baking, mix milk and chocolate fudge topping until well blended. When the cake is done and while it's still hot, poke holes in it with a fork or straw. Pour milk mixture over the cake. Allow cake to cool completely. Spread cream cheese frosting over the top. Chill. I made this cake today to take to a friend who had a death in her family. It was so delicious that I am making it for a party for tomorrow night. Very rich and the icing is soooooooooooo good! SO glad it was a success!!! That icing is amazing! I could just eat it straight off a spoon. So true confession...I also ate the icing straight off the spoon!!!!!!!!! I have now made this cake 3 times since you posted the recipe! Thanks for another keeper! That is awesome!! SO glad you are enjoying it!! Thank you Stephanie for your quick reply. Looking forward to making and eating !! I made the cake following your recipe and it is wonderful! One more question please. Do you thank this would work in a Bundt pan. I would appreciate your thoughts. Thank you!